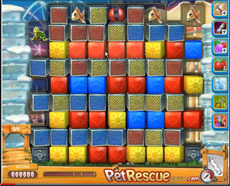 In pet rescue level 323 there are two wire creator machines in the two corners in the bottom of the screen. You have to clear blocks around them in order to keep them and the blocks around them, without wires. Clear a whole column so the pet in the right corner of the screen to be rescued immediately, as the whole board will be moved left. Try to rescue the two pets in the middle by clearing blocks under them. Probably you’ll activate the rocket once, so use it in the first column to rescue the pet, when the wire creator machine is unprotected. Pet rescue level 323 is not difficult indeed. But if you’ve stuck on it watch our simple strategy in the following vid.